Set in the leafy suburb of Epping and backing onto national park and Terry’s Creek, this modest split-level terrace was in drastic need of a facelift. Built in the 70’s by the Australian Navy, the tri level homes internal spaces were small and under utilised for today’s modern living requirements. The occupants of the home are a self-employed and VERY busy single mum and her teenage son. 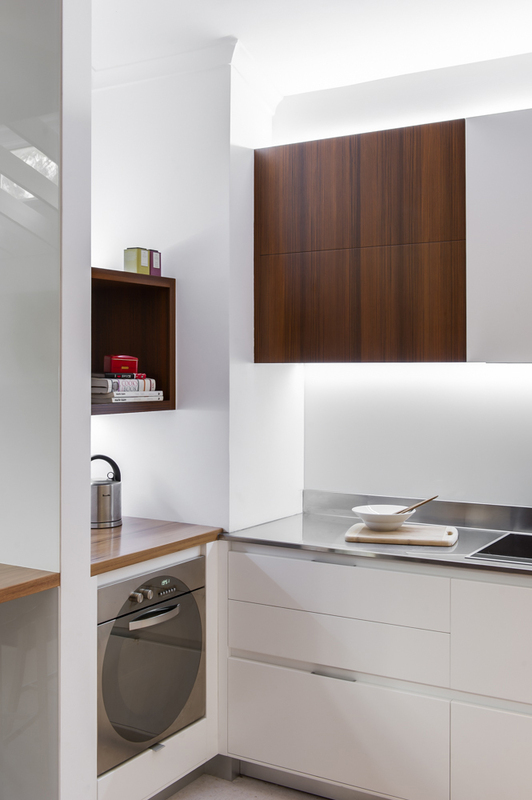 With not alot of time for domestic duties, her brief was simple… a clean, simple modern functional kitchen that could conceal a laundry and home office area. 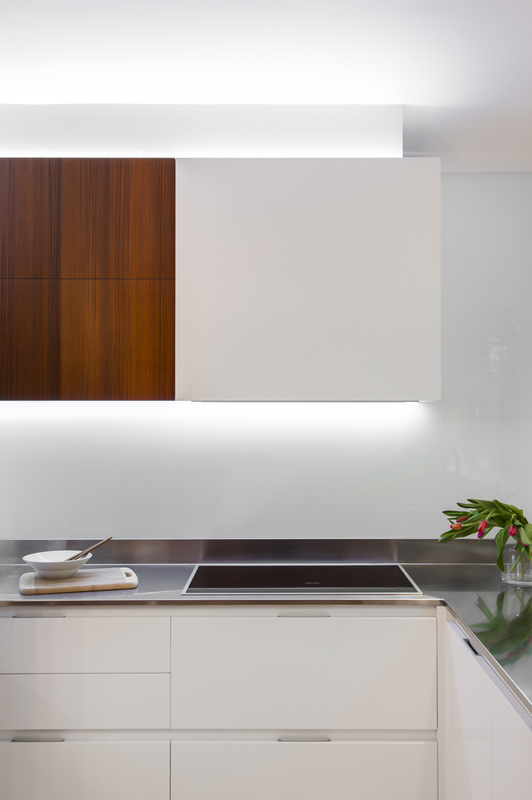 The only must on her list was stainless steel benchtops – her favourite. 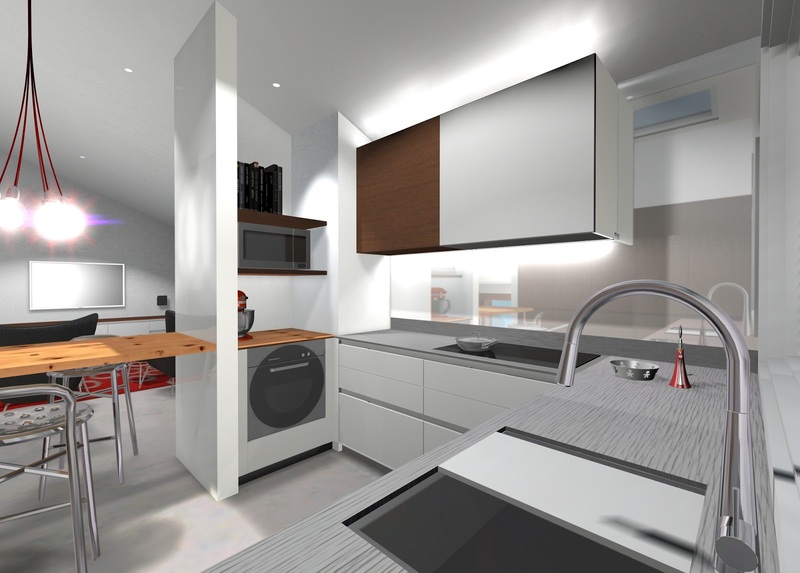 To create a clean & modern kitchen one that catered to modern living requirements. 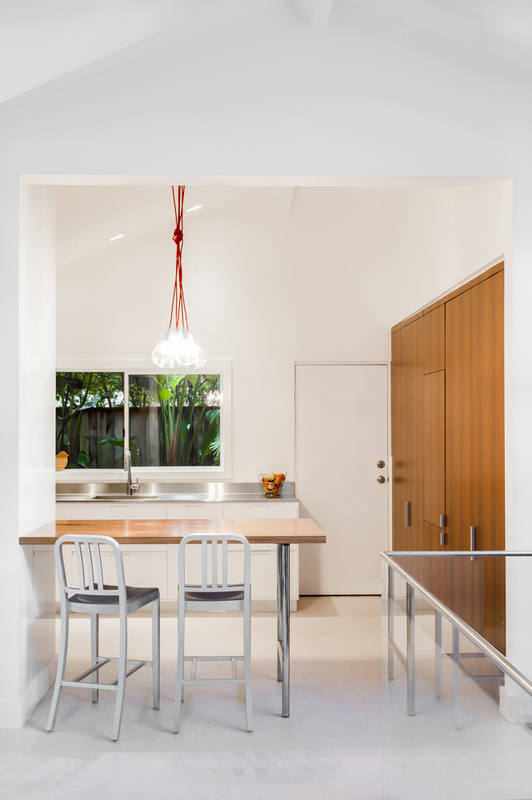 The space had to integrate a home office & laundry as well as an everyday eating area at least two. All this within its existing footprint. A challenge in the making! 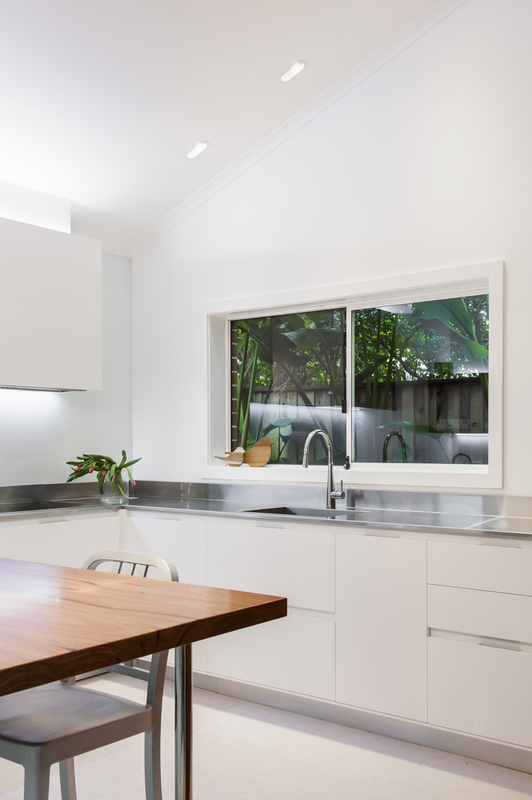 · Clean and fresh looking - a white kitchen?? 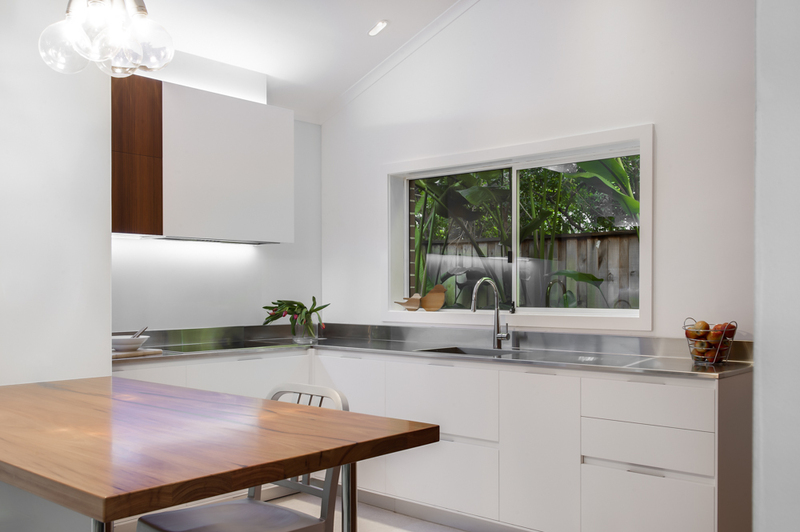 · Stainless Steel benchtops- a must! · Small footprint & floor space limited. As far as layout goes there really was not a lot of flexibility with the footprint of the kitchen, it could not be changed or relocated. It was a matter of making use of the available space and organising the zones so they would function efficiently for this family. 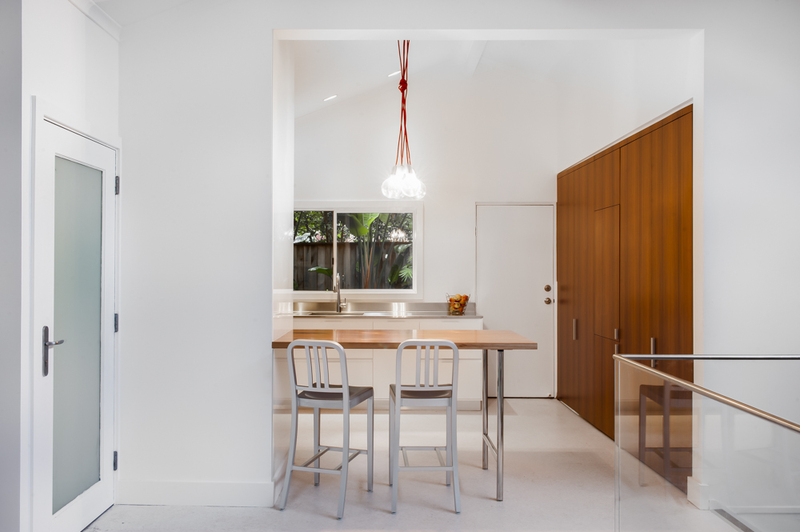 The designer chose to place the tall run of joinery items under the existing bulkhead (carpenters had recently commenced renos). This was the first thing on view when entering the terrace. 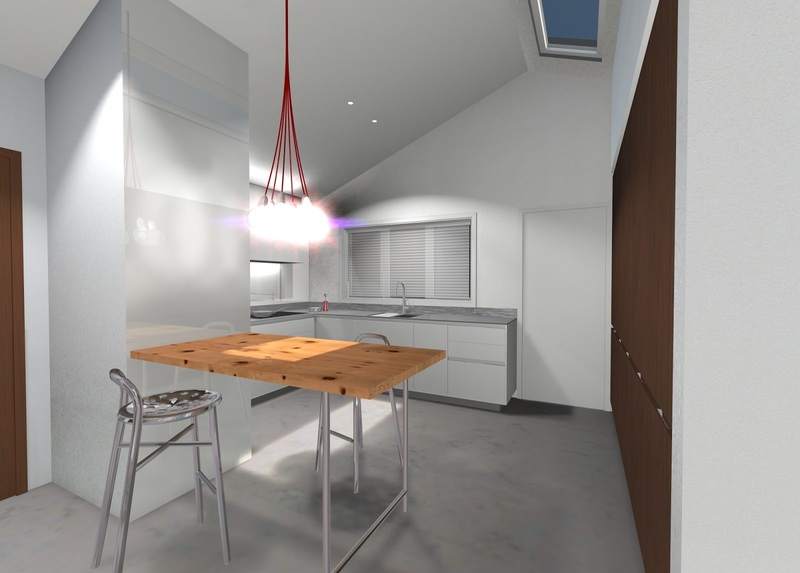 These full height doors house the laundry nook, home office (behind pocket bi-folding doors) & integrated refrigerator. All nicely tucked away when not in use. The use of a beautiful rich reddish timber veneer complimented the pendant light selected as well as being the clients’ favourite colour. The sink was placed under the window and the cooktop adjacent creating the perfect working triangle with plenty of preparation space in between. To free the splashback of penetrations, and keep the visual clean a pop up GPO was placed in this corner to assist in prep. The former fridge cavity made the ideal zone for conceal the “breakfast nook”. It keeps some of the everyday small appliances such as toaster and kettle concealed from view; this area is also home to the oven and microwave. LED lights have been installed for task lighting here so there are no working shadows and also above the microwave to fill the area with room light. Lighting was important requirement to our client. It was decided to create a multi layered lighting scheme. 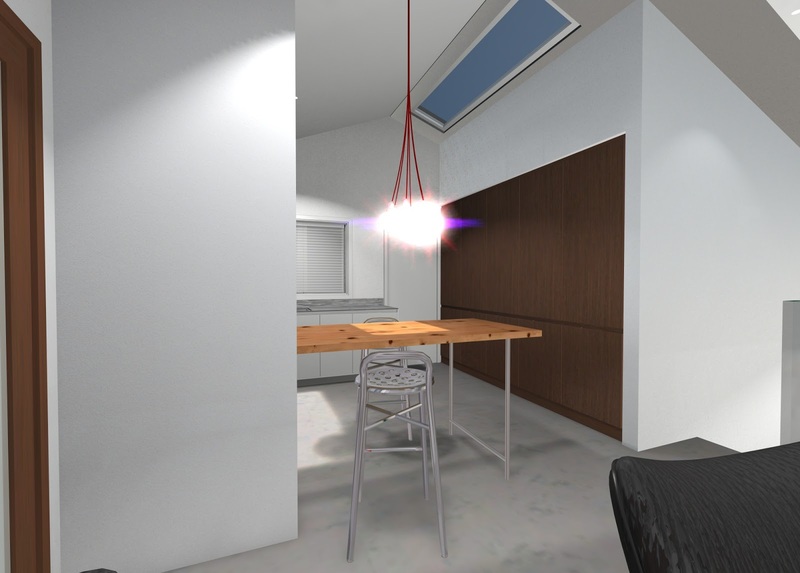 This way the client could light the space dependant on her mood and task needs. 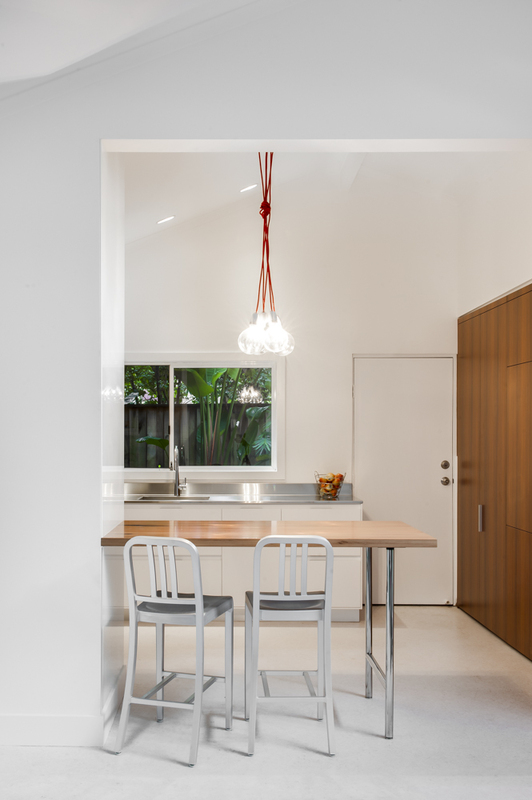 The primary room light was the LED up light & task lighting, next halogen adjustable heads are ceiling mounted to function as task light and finally oversized E27 bulbs with a splash of colour on the cord are the feature pendant light over the meals bench. The LED up lights not only provide much need room light, they help to make this tight footprint feel that much larger by creating a real sense of scale (especially up into the rack of the ceiling). 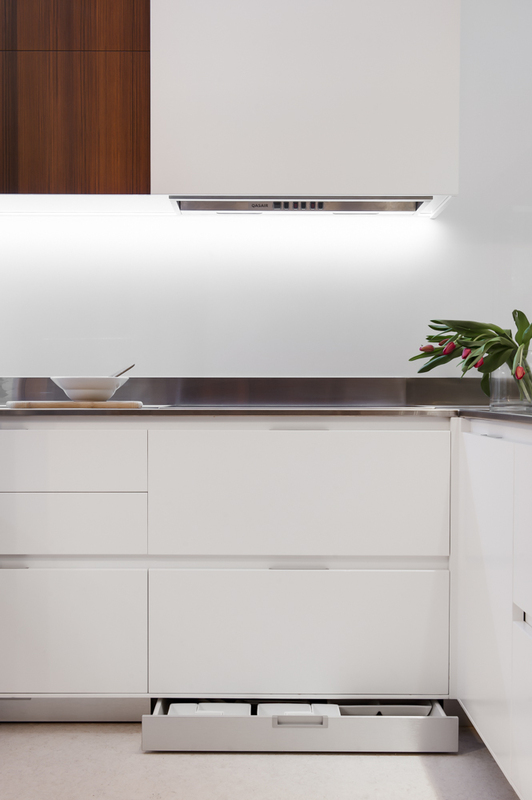 The adjustable head halogen lights have been installed with a narrow beam globes so that it is filling the benchtop with light, not flooding the room with unnecessary secondary beam. Finishes selected lift and warm the interior. 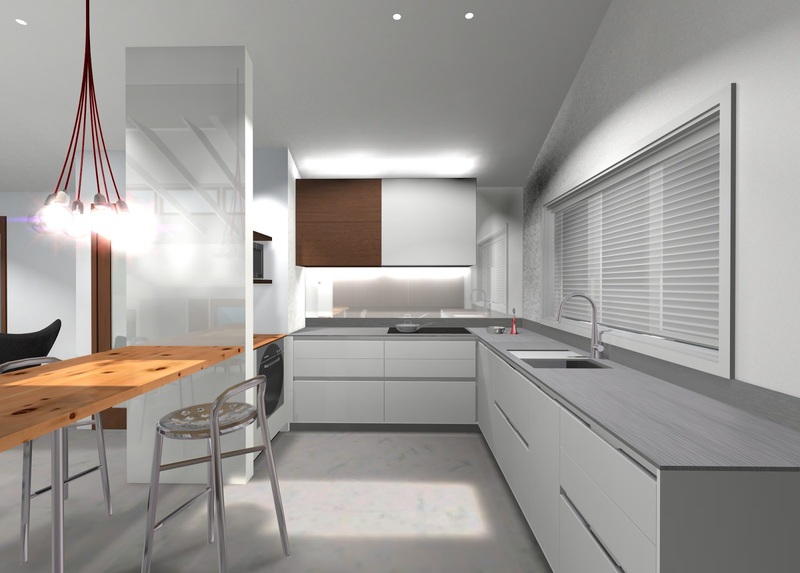 The client conveyed wishes for a white kitchen (in her eyes this represented fresh and clean). Not a favourite choice with the designer but understanding of the clients reasons (behind her request) the white was selected for the base cabinet and wall unit fronts and splashback only. 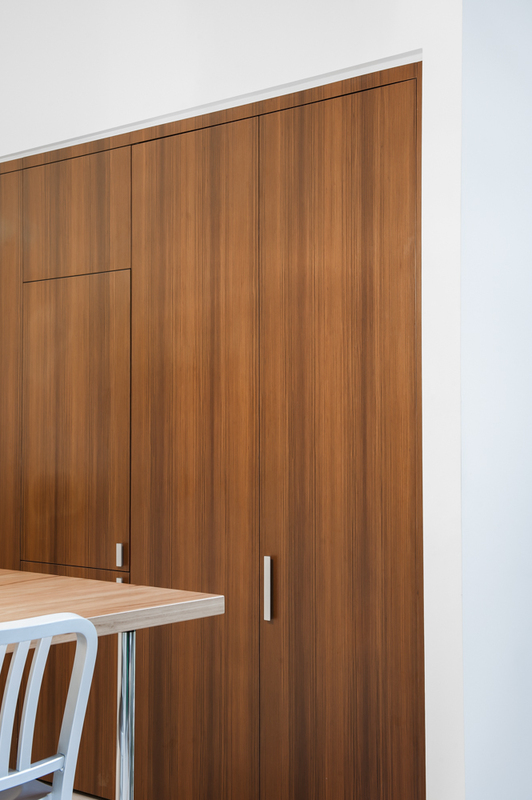 Tall units were a selected warm red veneer. Once teamed with the stainless steel benchtop in a 18mm thick profile and a recycled piece of Blackbutt solid timber for the server/meals bench installed on a custom designed and made stainless steel frame it all worked harmoniously together. When deliberating about whether to run overhead storage units in the space, the designer had a few considerations to ponder. The client was only 1.5m tall to start and it would perhaps cut-off the visual height of the racked ceiling. It was decided instead to finish them short to create an asymmetrical balance to the room. 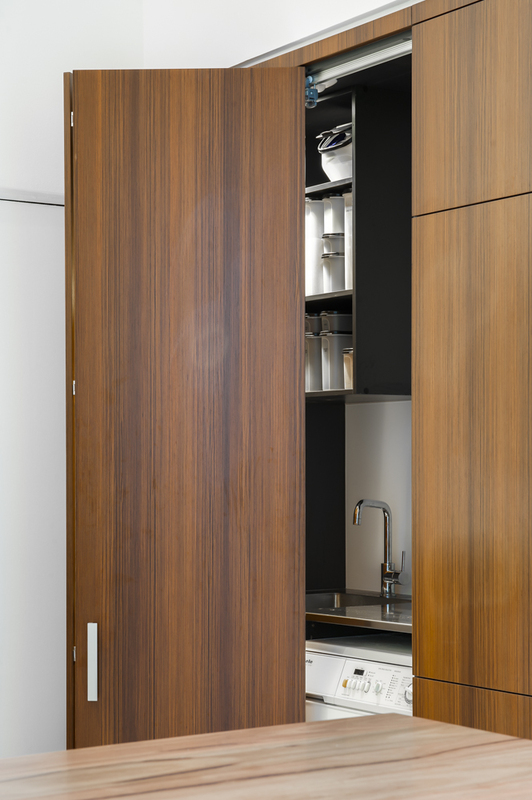 The Blum Aventos (electric opener) was selected on the left unit, so the doors could be open completely away to prevent any head collisions. The overall space has been transformed. A clean minimal palette along with the layered lighting plan helps to bring a real sense of scale to the space. Clean and crisp in appearance this space has fulfilled the brief of understated elegance and re-instated the kitchen as the real hub of their home. A place where they now come together and enjoy life.